This article will examine the differences and similarities between Shia Muslims and Sunni Muslims prayer. The first thing to acknowledge is that there are differences. Sunni and Shia have different collections of hadiths and therefore have different understandings of Islam. The other important point to note is that there are differences within each school, especially within the Sunni school of thought. The Malikis pray with their arms by their side. Hanfi’ men should place his hands below the navel in prayer and the woman upon her chest. Other Sunni schools have variable opinions. The Sha’afi say “Bismillah” out loud in the loud salah, the others do not. The Hanafis observe: It is wajib upon a woman to cover the back of her hands and the soles of her feet as well, and upon a man to cover his knees in addition to the area between the navel and the knees. The Shafi’is and Malikis say: It is permissible for a woman to keep her face and both the palms and the back of her hands uncovered during salat. The Hanbalis state: It is not permissible for her to expose any part except the face. There are many other subtle differences, but not significant ones. 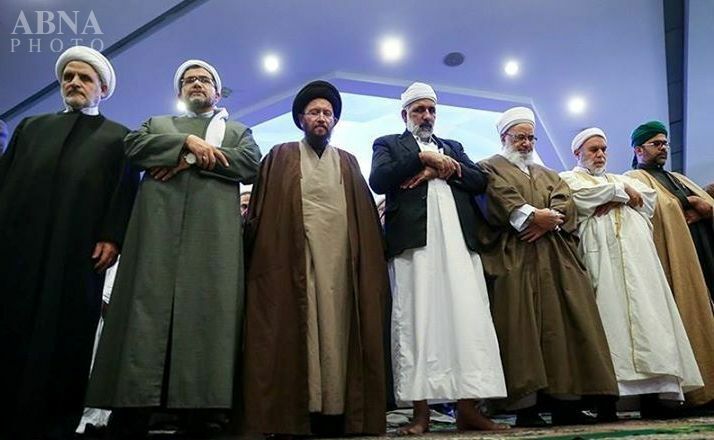 The Sunnis are the ones with the hands crossed, the Shia have their arms to the sides. – Sunnis have arms folded in various position, from below navel to the chest, right over left. Shia keep arms straight by the sides. – Shias usually raise their hands for each Allahu Akbar in the salah. – Words in Ruku and Sajda are the same. – When Sunnis getting up from Ruku they usually say Rabbanaa wa la kal-hamd, shia do not. – Sunni Say Ameen after Surah al Hamd, where as Shias usually say Alhamdolillahi Rabil Alameen. – Sunnis don’t have qunoot in the 2nd rakat, shia do. – In the 2nd rakah the wording of the Tahashud is different. – Shias usually recite Subhaaanallahi wal Hamdolillahi wa laa ilaaha illallahu Allahu Akbar in the 3rd/4th rakah, the Sunni recite surah Fateha. – After sajda Sunni get up straight into qiyam. Shia sit down and then get up into qiyam position and say Bihawlillahi ta’aala wa quwatai hi wa aqoomo wa aqud. – Shia Salah ends with Assalamuallaikum Warahmatullahi Wabarakatuhu whlie in the sitting position and as mustahab we say Takbir 3 times. Sunni do not have takbir at the end. – Shia recite Bismillah loudly in every Salah. – In Fajar, Maghrib and Isha namaz, Shia read everything aloud (sajda, ruku, tashahud, qunoot) except in the 3rd and 4th rakah while in qiyam. – Sunni can recite a surah after Surah Fatiha in the first rakah and read half of it and continue it in the 2nd rakah, for Shia it’s highly recommended to read surah Ikhlaas in the 2nd rakah, and it’s the only surah Shia can read both in the first and 2nd rakah in the same Salah. Do you know any other differences? Please use the comments box below to let us know. 27|2|Guidance and good news for the believers.